EUR/USD holds onto to its high ground on the last full trading day before the Christmas holiday. Can it enjoy a “Santa Rally” and push even higher? The odds are in favor of the pair. The Technical Confluences Indicator shows that support is stronger than resistance. 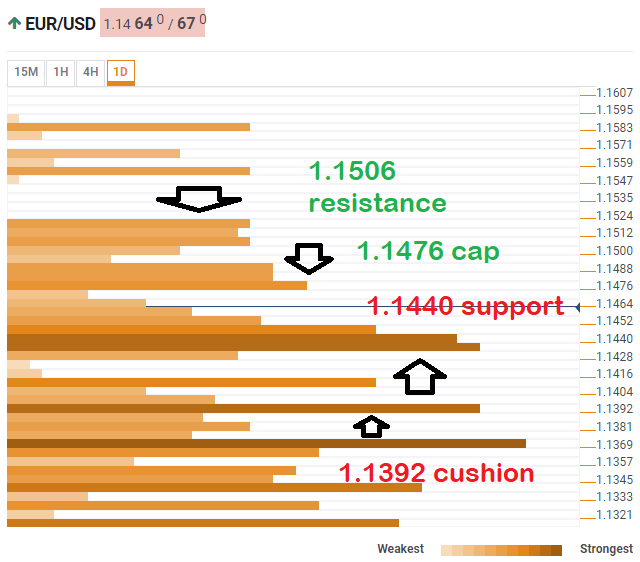 Euro/dollar has significant support at around 1.1440 where we see a dense cluster of lines including the all-important Fibonacci 38.2% one-day, the Bollinger Band one-day Upper, the Fibonacci 23.6% one-month, the Simple Moving Average 200-15m, the SMA 50-1h, the SMA 10-4h, and the BB 1h-Lower. Another considerable convergence of potent lines awaits at 1.1392 where we see the SMA 100-1h, the SMA 50-one-day, the Fibonacci 38.2% one-month, and the Pivot Point one-day Support 1. Looking up, 1.1476 is the first notable resistance area where we see the meeting point of the BB 4h-Upper, the BB 1h-Upper, and the Pivot Point one-month Resistance 1. The next notable cap is at around 1.1506, already above the round number. We see the confluence of the PP one-day R1, the PP 1w-R2, and last month’s high. All in all, the path of least resistance is to the upside. This tool assigns a certain amount of “weight” to each indicator, and this “weight” can influence adjacents price levels. These weightings mean that one price level without any indicator or moving average but under the influence of two “strongly weighted” levels accumulate more resistance than their neighbors. In these cases, the tool signals resistance in apparently empty areas.